OS X is based upon the Mach kernel. Certain parts from FreeBSD's and NetBSD's implementation of Unix were incorporated in NeXTSTEP, the core of Mac OS X. NeXTSTEP was the graphical, object-oriented, and UNIX-based operating system developed by Steve Jobs' company NeXT after he left Apple in 1985. While Jobs was away from Apple, Apple tried to create a "next-generation" OS through the Taligent, Copland and Gershwin projects, with little success. Eventually, NeXT's OS, then called OPENSTEP, was selected to be the basis for Apple's next OS, and Apple purchased NeXT outright. Steve Jobs returned to Apple as interim CEO, and later became CEO, shepherding the transformation of the programmer-friendly OPENSTEP into a system that would be adopted by Apple's primary market of home users and creative professionals. The project was first known as Rhapsody and was later renamed to Mac OS X.
Mac OS X originally ran on PowerPC-based Macs. In 2006, the first Intel Macs had a specialized version of 10.4 "Tiger". In 2007, 10.5 "Leopard" was the first to run on both PowerPC and Intel Macs with the use of Universal Binaries. 10.6 "Snow Leopard" was the first version of OS X to drop support for PowerPC Macs. Mac OS X Server 1.x was incompatible with software designed for the original Mac OS and had no support for Apple's own IEEE 1394 (FireWire) interface. Mac OS X 10.x included more backward compatibility through Classic and more functionality by introducing the Carbon API as well as FireWire support. As the operating system evolved, it moved away from the legacy Mac OS to an emphasis on new "digital lifestyle" applications such as the iLife suite, enhanced business applications (iWork), and integrated home entertainment (the Front Row media center). 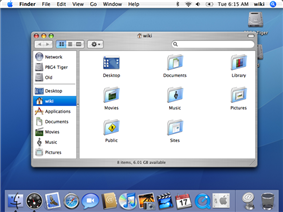 Each version also included modifications to the general interface, such as the brushed metal appearance added in version 10.3, the non-pinstriped titlebar appearance in version 10.4, and in 10.5 the removal of the previous brushed metal styles in favor of the "Unified" gradient window style. In 2012, with the release of OS X 10.8, the "Mac" prefix was officially dropped in all references to the operating system name within its web site. Box/Mac App Store artwork for OS X. Left to right: Cheetah/Puma (1), Jaguar (2), Panther (3), Tiger (4), Leopard (5), Snow Leopard (6), Lion (7), Mountain Lion (8), Mavericks (9), Yosemite (10). OS X is the tenth major version of Apple's operating system for Macintosh computers. Previous Macintosh operating systems were named using Arabic numerals, e.g. Mac OS 8 and Mac OS 9. The letter X in OS X's name refers to the number 10, a Roman numeral. It is therefore correctly pronounced "ten" in this context. However, a common mispronunciation is "X" . OS X's core is a POSIX compliant operating system (OS) built on top of the XNU kernel, with standard Unix facilities available from the command line interface. Apple has released this family of software as a free and open source operating system named Darwin. On top of Darwin, Apple layered a number of components, including the Aqua interface and the Finder, to complete the GUI-based operating system which is OS X.
OS X introduced a number of new capabilities to provide a more stable and reliable platform than its predecessor, Mac OS 9. For example, pre-emptive multitasking and memory protection improved the system's ability to run multiple applications simultaneously without them interrupting or corrupting each other. Many aspects of OS X's architecture are derived from OPENSTEP, which was designed to be portable, to ease the transition from one platform to another. For example, NeXTSTEP was ported from the original 68k-based NeXT workstations to x86 and other architectures before NeXT was purchased by Apple, and OPENSTEP was later ported to the PowerPC architecture as part of the Rhapsody project. The most visible change was the Aqua theme. The use of soft edges, translucent colors, and pinstripes—similar to the hardware design of the first iMacs—brought more texture and color to the user interface when compared to what OS 9 and OS X Server 1.0's "Platinum" appearance had offered. According to John Siracusa, an editor of Ars Technica, the introduction of Aqua and its departure from the then conventional look "hit like a ton of bricks." Bruce Tognazzini (who founded the original Apple Human Interface Group) said that the Aqua interface in Mac OS X v10.0 represented a step backwards in usability compared with the original Mac OS interface. Third-party developers started producing skins for customizable applications and other operating systems which mimicked the Aqua appearance. To some extent, Apple has used the successful transition to this new design as leverage, at various times threatening legal action against people who make or distribute software with an interface the company says is derived from its copyrighted design. The architecture of OS X incorporates a layered design. The layered frameworks aid rapid development of applications by providing existing code for common tasks. OS X includes its own software development tools, most prominently an integrated development environment called Xcode. Xcode provides interfaces to compilers that support several programming languages including C, C++, Objective-C, and Java. For the Apple–Intel transition, it was modified so that developers could build their applications as a universal binary, which provides compatibility with both the Intel-based and PowerPC-based Macintosh lines. First and third-party applications can be controlled programatically using the AppleScript framework, retained from classic Mac OS, or using the newer Automator application. The Darwin sub-system in Mac OS X is in charge of managing the filesystem, which includes the Unix permissions layer. In 2003 and 2005, two Macworld editors expressed criticism of the permission scheme; Ted Landau called misconfigured permissions "the most common frustration" in Mac OS X, while Rob Griffiths suggested that some users may even have to reset permissions every day, a process which can take up to 15 minutes. More recently, another Macworld editor, Dan Frakes, called the procedure of repairing permissions vastly overused. He argues that OS X typically handles permissions properly without user interference, and resetting permissions should just be tried when problems emerge. As of September 2011, OS X is the second-most-active general-purpose client operating system in use on the World Wide Web, (after Microsoft Windows), with an 8.45% usage share according to statistics compiled by W3Counter. It is the most successful Unix-like desktop operating system on the web, estimated at over 5 times the usage of Linux (which has 1.5%). There are twenty-two "System Languages" available for the user at the moment of installation (the "system language" is the entire operating system environment). As of Mac OS X Lion, the languages are Arabic, Chinese (Simplified), Chinese (Traditional), Czech, Danish, Dutch, English, Finnish, French, German, Hebrew, Hungarian, Italian, Japanese, Korean, Norwegian, Polish, Portuguese (Brazilian), Portuguese (European), Russian, Spanish, Swedish and Turkish. Input methods for typing in dozens of scripts can be chosen independently of the system language. The APIs that OS X inherited from OpenStep are not backward compatible with earlier versions of Mac OS. These APIs were created as the result of a 1993 collaboration between NeXT Computer and Sun Microsystems and are now referred to by Apple as Cocoa. This heritage is highly visible for Cocoa developers, since the "NS" prefix is ubiquitous in the framework, standing variously for Nextstep or NeXT/Sun. The official OpenStep API, published in September 1994, was the first to split the API between Foundation and Application Kit and the first to use the "NS" prefix. Apple's Rhapsody project would have required all new development to use these APIs, causing much outcry among existing Mac developers. All Mac software that did not receive a complete rewrite to the new framework would run in the equivalent of the Classic environment. To permit a smooth transition from Mac OS 9 to (Mac) OS X, the Carbon Application Programming Interface (API) was created. Applications written with Carbon can be executed natively on both systems. Carbon was not included in the first product sold as "Mac OS X": Mac OS X Server (now referred to as Mac OS X Server 1.x). OS X also used to support the Java Platform as a "preferred software package"—in practice this means that applications written in Java fit as neatly into the operating system as possible while still being cross-platform compatible, and that graphical user interfaces written in Swing look almost exactly like native Cocoa interfaces. Traditionally, Cocoa programs have been mostly written in Objective-C, with Java as an alternative. However, on July 11, 2005, Apple announced that "features added to Cocoa in Mac OS X versions later than 10.4 will not be added to the Cocoa-Java programming interface." ^ "Cocoa - OS X Technology Overview". ^ a b c "Mac OS X Version 10.5 on Intel-based Macintosh computers". The Open Group. Retrieved December 4, 2014. ^ a b "Mac OS X Version 10.6 on Intel-based Macintosh computers". The Open Group. Retrieved December 4, 2014. ^ a b "Apple technology brief on UNIX". ^ a b "Mac OS X Version 10.8 on Intel-based Macintosh computers". The Open Group. Retrieved December 4, 2014. ^ a b "OS X Version 10.9 on Intel-based Macintosh computers". The Open Group. Retrieved December 4, 2014. ^ a b "OS X version 10.10 Yosemite on Intel-based Mac computers". The Open Group. Retrieved December 4, 2014. ^ a b "What is an operating system (OS)?". ^ Ha, Anthony (June 10, 2013). "Apple Has A New, California-Based Naming Scheme For OS X, Starting With OS X Mavericks". TechCrunch. Retrieved June 10, 2013. ^ "Desktop Operating System Market Share". Net Applications. ^ "Worldwide user OS families use in September 2014". ^ "Top 8 Operating System from Aug 2011 to September 2014". ^ Haslam, Karen (January 2007). "Macworld Expo: Optimised OS X sits on 'versatile' flash". ^ Foresman, Chris (September 2010). "Apple TV definitely running iOS, could be jailbreak target". ^ Singh, Amit. "Architecture of Mac OS X". What is Mac OS X?. Retrieved April 7, 2006. ^ Markoff, John (December 23, 1996). "Why Apple Sees Next as a Match Made in Heaven". ^ W., Jeff (May 27, 2008). 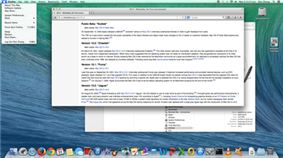 "Mac OS X (10.5) – User Interface Changes". University of Wisconsin. Retrieved April 15, 2009. ^ Rizzo, John (November 12, 2003). "Mac OS X 10.3 Panther". Retrieved April 15, 2009. Once you reboot, you'll notice that Apple has abandoned the light and airy Aqua interface for the darker, heavier brushed-metal look of iTunes. ^ Siracusa, John (March 24, 2006). "Five years of Mac OS X". ^ Kelly, Spencer (February 26, 2011 time: 00:12:45). "BBC Click programme". BBC. Retrieved March 20, 2011. Now we have dealt with this a number of times over the years. Of course X does mean 10, but anyone who used to poke around on Unix systems will know that in those days anything Unix had an X (ˈɛks) in it, and OS Ten is written OS X (ˈɛks) in honour of the fact that it is based on Unix, unlike its predecessors. So, hey, you can say it any way you want; me, I'm showing my age and sticking with X (ˈɛks). ^ Grothaus, Michael (April 12, 2011). "Mac OS X Lion to tone down the Aqua". The Unofficial Apple Weblog. ^ Raymond, Eric Steven. "The Elements of Operating-System Style". Retrieved November 5, 2008. ^ a b "Cocoa Fundamentals Guide: A Bit of History". ADC Reference Library. ^ Siracusa, John (October 28, 2007). "Mac OS X 10.5 Leopard: the Ars Technica review". ^ Tognazzini, Bruce (February 2000). "OS X: A First Look". Retrieved November 5, 2008. ^ "'"Apple lowers boom on Aqua 'skins. ^ "About the Technologies for Developing Mac OS X Software". ^ Zepko, Tom (November 6, 2003). "Why Cocoa?". Retrieved April 15, 2009. ^ "Adopting Universal Binaries on Mac OS X". ^ Griffiths, Rob (February 2005). "Prevent Mac Disasters". ^ Frakes, Dan (August 2006). "Repairing permissions: what you need to know". ^ Frakes, Dan (June 2008). "Five Mac maintenance myths". ^ a b "Global Web Stats". Operating System Market Share. W3Counter. September 2011. Retrieved October 28, 2011. ^ "System – New system languages.". ^ "Introduction to Cocoa-Java Integration Guide". ADC Reference Library. ^ "X11 for Mac OS X 1.0". ^ Ben Byer (October 27, 2007). "Re: X11 in Leopard: xterm on start-up". Apple's x11-users mailing list. Retrieved January 18, 2008. ^ Michael Larabel (May 28, 2011). "X.Org Server 1.10.2 Brings A Bunch Of Bug-Fixes". phoronix. Retrieved May 29, 2011. ^ Slivka, Eric (February 17, 2012). "Apple Removes X11 in OS X Mountain Lion, Shifts Support to Open Source XQuartz". MacRumors. Retrieved February 23, 2012. ^ a b "Mac OS X: System Requirements". ^ Rothenbourg, Matthew; dePlume, Nick (August 30, 2002). "'"Apple Keeps x86 Torch Lit with 'Marklar. eWeek.com. Retrieved June 8, 2013. ^ Clark, Don; Wingfield, Nick (May 23, 2005). "Apple Explores Use Of Chips From Intel For Macintosh Line". ^ Kanellos, Michael (May 23, 2005). "Apple to Intel: Some advantage, lots of risk". 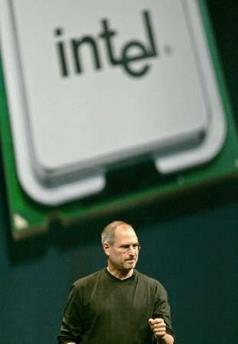 ^ "Apple to Use Intel Microprocessors Beginning in 2006" (Press release). ^ Landau, Ted (May 2006). "OS X First Aid". ^ Stevens, Tim (June 10, 2009). "Snow Leopard officially puts PowerPC Macs on endangered species list". ^ "The Aqua Interface". Apple Human Interface Guidelines. ^ a b Davidson, James Duncan (2002). Learning Cocoa With Objective-C. O'Reilly. p. 6. ^ O'Malley, Kevin (2003). Programming Mac OS X: A Guide for Unix Developers. Manning. p. 7. ^ "OS X. It's what makes a Mac a Mac.". ^ "About FileVault". Mac OS X 10.5 Help. ^ "Why Use Sync Services?". ^ "Spaces. Room for everything.". ^ "Time Machine. A giant leap backward.". ^ Holwerda, Thom (December 6, 2007). "Review: Mac OS X 10.5 Leopard". OS News. Retrieved April 15, 2009. The next area where Apple claims to have made major improvements is the Finder. ^ Siracusa, John (January 26, 2006). "Finding Leopard". ^ Siracusa, John (April 28, 2005). "Mac OS X 10.4 Tiger". ^ Davis, Jim (May 11, 1998). "OS X is the future for Apple". ^ "Apple Previews Next Version of Mac OS X" (Press release). ^ "Apple Previews "Jaguar", the Next Major Release of Mac OS X" (Press release). ^ """Apple Previews Mac OS X "Panther (Press release). ^ """Steve Jobs to Kick Off Apple's Worldwide Developers Conference 2004 with Preview of Mac OS X "Tiger (Press release). ^ "Apple Executives to Preview Mac OS X "Leopard" at WWDC 2006 Keynote" (Press release). ^ "Apple Previews Mac OS X Snow Leopard to Developers" (Press release). ^ "Apple Gives Sneak Peek of Mac OS X Lion" (Press release). ^ "Apple Releases OS X Mountain Lion Developer Preview with Over 100 New Features" (Press release). ^ a b "Mountain Lion Available Today From Mac App Store" (Press release). ^ "Live From Apple’s WWDC 2013 Keynote" (Press release). ^ Trademark #78257226 for Panther, #78269988 for Tiger, #78270003 for Leopard, #78271630 for Cougar and #78271639 for Lynx, all registered in 2004 by Apple Computer, Inc."United States Patent and Trademark Office". Retrieved December 20, 2006. ^ Kasper, Jade. "Court sides with Apple over "Tiger" trademark dispute". ^ John Siracusa. "Mac OS X Beta – Page 1 – (10/2000)". ^ "Mac OS X Public Beta Expires Today | News". The Mac Observer. Retrieved March 11, 2010. ^ Although the version is now called Cheetah by users, rare evidences can be found to prove that it was called so internally. For instance, a Q&A was created in 2005 which mentions it. "Technical Q&A". ^ "Apple Cease-And-Desists Stupidity Leak". Slashdot. 2001. Retrieved November 5, 2008. ^ "Apple Makes Mac OS X the Default Operating System on All Macs" (Press release). ^ "Jaguar "Unleashed" at 10:20 pm Tonight" (Press release). ^ "Wayback Machine's Cache of the OS X 10.2 Product Information Page". ^ "Apple Previews "Jaguar," the Next Major Release of Mac OS X" (Press release). ^ """Apple Announces Mac OS X "Panther (Press release). ^ "Apple Unleashes "Tiger Friday at 6:00 pm" (Press release). ^ "Apple unveils Intel iMacs". AppleInsider. January 2006. Retrieved December 15, 2008. ^ "Apple – Mac OS X Leopard – Features – 300+ New Features". ^ "Mac OS X Leopard – Technology – UNIX". Leopard Technology Overview. ^ "Do Classic applications work with Mac OS X 10.5 or Intel-based Macs?". Knowledge Base. ^ Lynch, Steven (June 12, 2008). "Mac OS X Snow Leopard Drops PowerPC Support". HardOCP. Retrieved October 20, 2010. ^ Reisinger, Don (January 6, 2011). "Mac App Store launches on Snow Leopard". CNET. ^ "Apple – OS X Lion - The world's most advanced desktop operating system.". ^ "Apple – OS X Mountain Lion - The world's most advanced desktop operating system.". ^ Panzarino, Matthew (February 16, 2012). "Apple courts China with Sina Weibo, Baidu, Youku and more integrated in Mountain Lion". The Next Web. Retrieved March 15, 2012. ^ "OS X Mavericks Available Today Free from the Mac App Store" (Press release). As of OS X Mountain Lion, Software Update has been merged into the Mac App Store. Software Updates consist of incremental updates of the Mac OS and its applications, Security Updates, device drivers and firmware updates. All software updates require the user to enter their administrative password, as with all consequential system changes. Some updates require a system restart. Starting with OS X 10.5, updates that require a reboot log out the user prior to installation and automatically restart the computer when complete; in earlier versions, the updates are installed, but critical files are not replaced until the next system startup. The program is part of the CoreServices in OS X. Software Update can be set to check for updates daily, weekly, monthly, or not at all; in addition, it can download and store the associated .pkg file (the same type used by Installer) to be installed at a later date and maintains a history of installed updates. Software Update is a software tool by Apple Inc. that installs the latest version of Apple software on computers running OS X. It was originally introduced to Mac users in Mac OS 9. A Windows version has been available since the introduction of iTunes 7, under the name Apple Software Update. Software Update automatically informs users of new updates. OS X can be updated using the Apple App store. Until OS X Mountain Lion, the updating method was to use the Apple Software Update. OS X 10.10 "Yosemite" was released on October 16, 2014. Apple's showcase new feature in Yosemite is Handoff, which enables users with iPhones running iOS 8.1 or later to answer phone calls, receive and send SMS messages, and complete unfinished iPhone emails on their Mac. OS X 10.9 "Mavericks" was released on October 22, 2013. This is a free upgrade to all users running OS X Snow Leopard or later. Its changes include the addition of the previously iOS-only Maps and iBooks applications, improvements to the Notification Center, enhancements to several applications, and many under-the-hood improvements. The App Store from then on was required for updating. The new update replaced Apple Software Update. OS X v10.8 "Mountain Lion" was released on July 25, 2012. It incorporates some features seen in iOS 5, which include Game Center, support for iMessage in the new Messages messaging application, and Reminders as a to-do list app separate from iCal (which is renamed as Calendar, like the iOS app). It also includes support for storing iWork documents in iCloud. Notification Center, which makes its debut in Mountain Lion, is a desktop version similar to the one in iOS 5.0 and higher. Application pop-ups are now concentrated on the corner of the screen, and the Center itself is pulled from the right side of the screen. Mountain Lion also includes more Chinese features including support for Baidu as an option for Safari search engine, QQ, 163.com and 126.com services for Mail, Contacts and Calendar, Youku, Tudou and Sina Weibo are integrated into share sheets. Changes made to the GUI (Graphical User Interface) include the Launchpad (similar to the home screen of iOS devices), auto-hiding scrollbars that only appear when they are being used, and Mission Control, which unifies Exposé, Spaces, Dashboard, and full-screen applications within a single interface. Apple also made changes to applications: they resume in the same state as they were before they were closed (similar to iOS). Documents auto-save by default. Mac OS X v10.7 "Lion" was released on July 20, 2011. It brought developments made in Apple's iOS, such as an easily navigable display of installed applications (Launchpad) and a greater use of multi-touch gestures, to the Mac. This release removed Rosetta, making it incapable of running PowerPC applications. 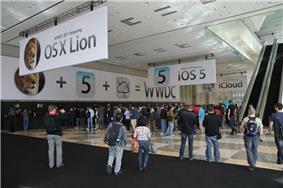 Mac OS X Lion was announced at WWDC 2011 at Moscone West. An update introduced support for the Mac App Store, Apple's digital distribution platform for OS X applications. Mac OS X v10.6 also featured new 64-bit technology capable of supporting greater amounts of RAM, improved support for multi-core processors through Grand Central Dispatch, and advanced GPU performance with OpenCL. Mac OS X v10.6 "Snow Leopard" was released on August 28, 2009. Rather than delivering big changes to the appearance and end user functionality like the previous releases of Mac OS X, Snow Leopard focused on "under the hood" changes, increasing the performance, efficiency, and stability of the operating system. For most users, the most noticeable changes were: the disk space that the operating system frees up after a clean install compared to Mac OS X 10.5 Leopard, a more responsive Finder rewritten in Cocoa, faster Time Machine backups, more reliable and user friendly disk ejects, a more powerful version of the Preview application, as well as a faster Safari web browser. Snow Leopard only supported machines with Intel CPUs, required at least 1 GB of RAM, and dropped default support for applications built for the PowerPC architecture (Rosetta could be installed as an additional component to retain support for PowerPC-only applications). Mac OS X v10.5 "Leopard" was released on October 26, 2007. It was called by Apple "the largest update of Mac OS X". It brought more than 300 new features. Leopard supports both PowerPC- and Intel x86-based Macintosh computers; support for the G3 processor was dropped and the G4 processor required a minimum clock rate of 867 MHz, and at least 512 MB of RAM to be installed. The single DVD works for all supported Macs (including 64-bit machines). New features include a new look, an updated Finder, Time Machine, Spaces, Boot Camp pre-installed, full support for 64-bit applications (including graphical applications), new features in Mail and iChat, and a number of new security features. Leopard is an Open Brand UNIX 03 registered product on the Intel platform. It was also the first BSD-based OS to receive UNIX 03 certification. Leopard dropped support for the Classic Environment and all Classic applications. It was the final version of Mac OS X to support the PowerPC architecture. Mac OS X v10.4 "Tiger" was released on April 29, 2005. Apple stated that Tiger contained more than 200 new features. As with Panther, certain older machines were no longer supported; Tiger requires a Mac with 256MB and a built-in FireWire port. Among the new features, Tiger introduced Spotlight, Dashboard, Smart Folders, updated Mail program with Smart Mailboxes, QuickTime 7, Safari 2, Automator, VoiceOver, Core Image and Core Video. The initial release of the Apple TV used a modified version of Tiger with a different graphical interface and fewer applications and services. On January 10, 2006, Apple released the first Intel-based Macs along with the 10.4.4 update to Tiger. This operating system functioned identically on the PowerPC-based Macs and the new Intel-based machines, with the exception of the Intel release dropping support for the Classic environment. On August 23, 2002, Apple followed up with Mac OS X v10.2 "Jaguar", the first release to use its code name as part of the branding. It brought great raw performance improvements, a sleeker look, and many powerful user-interface enhancements (over 150, according to Apple ), including Quartz Extreme for compositing graphics directly on an ATI Radeon or Nvidia GeForce2 MX AGP-based video card with at least 16 MB of VRAM, a system-wide repository for contact information in the new Address Book, and an instant messaging client named iChat. The Happy Mac which had appeared during the Mac OS startup sequence for almost 18 years was replaced with a large grey Apple logo with the introduction of Mac OS X v10.2. Later that year on September 25, 2001, Mac OS X v10.1 (internally codenamed Puma) was released. It featured increased performance and provided missing features, such as DVD playback. Apple released 10.1 as a free upgrade CD for 10.0 users, in addition to the US$129 boxed version for people running Mac OS 9. It was discovered that the upgrade CDs were full install CDs that could be used with Mac OS 9 systems by removing a specific file; Apple later re-released the CDs in an actual stripped-down format that did not facilitate installation on such systems. On January 7, 2002, Apple announced that Mac OS X was to be the default operating system for all Macintosh products by the end of that month. On September 13, 2000 Apple released a $29.95 "preview" version of Mac OS X (internally codenamed Kodiak) in order to gain feedback from users. With the exception of Mac OS X Server 1.0 and the original public beta, OS X versions were named after big cats until version 10.9, when Apple switched to using California locations. Prior to its release, version 10.0 was code named "Cheetah" internally at Apple, and version 10.1 was code named internally as "Puma". After the immense buzz surrounding version 10.2, codenamed "Jaguar", Apple's product marketing began openly using the code names to promote the operating system. 10.3 was marketed as "Panther", 10.4 as "Tiger", 10.5 as "Leopard", 10.6 as "Snow Leopard", 10.7 as "Lion", 10.8 as "Mountain Lion", and 10.9 as "Mavericks". "Panther", "Tiger" and "Leopard" are registered as trademarks of Apple, but "Cheetah", "Puma" and "Jaguar" have never been registered. Apple has also registered "Lynx" and "Cougar" as trademarks, though these were allowed to lapse. Computer retailer Tiger Direct sued Apple for its use of the name "Tiger". On May 16, 2005 a US federal court in the Southern District of Florida ruled that Apple's use did not infringe on Tiger Direct's trademark. Finder is a file browser allowing quick access to all areas of the computer, which has been modified throughout subsequent releases of Mac OS X. Quick Look is part of Mac OS X Leopard's Finder. It allows for dynamic previews of files, including videos and multi-page documents, without opening their parent applications. Spotlight search technology, which is integrated into the Finder since Mac OS X Tiger, allows rapid real-time searches of data files; mail messages; photos; and other information based on item properties (meta data) and/or content. Mac OS X makes use of a Dock, which holds file and folder shortcuts as well as minimized windows. As of version 10.5, all system icons are scalable up to 512×512 pixels, to accommodate various places where they appear in larger size, including for example the Cover Flow view, a three-dimensional graphical user interface included with iTunes, the Finder, and other Apple products for visually skimming through files and digital media libraries via cover artwork. This version includes Spaces, a virtual desktop implementation which enables the user to have more than one desktop and display them in an Exposé-like interface. Mac OS X v10.5 includes an automatic backup technology called Time Machine, which provides the ability to view and restore previous versions of files and application data; and Screen Sharing was built in for the first time. In version 10.3, Apple added Exposé, a feature which includes three functions to help accessibility between windows and desktop. Its functions are to instantly display all open windows as thumbnails for easy navigation to different tasks, display all open windows as thumbnails from the current application, and hide all windows to access the desktop. Also, FileVault was introduced, which is an optional encryption of the user's files with Advanced Encryption Standard (AES-128). The human interface guidelines published by Apple for Mac OS X are followed by many applications, giving them consistent user interface and keyboard shortcuts. In addition, new services for applications are included, which include spelling and grammar checkers, special characters palette, color picker, font chooser and dictionary; these global features are present in every Cocoa application, adding consistency. The graphics system OpenGL composites windows onto the screen to allow hardware-accelerated drawing. This technology, introduced in version 10.2, is called Quartz Extreme, a component of Quartz. Quartz's internal imaging model correlates well with the Portable Document Format (PDF) imaging model, making it easy to output PDF to multiple devices. As a side result, PDF viewing and creating PDF documents from any application are built-in features. Apple has continued to change aspects of the OS X appearance and design, particularly with tweaks to the appearance of windows and the menu bar. One example of a UI behavioral change is that previewed video and audio files no longer have progress bars in column view; instead, they have mouse-over start and stop buttons as of 10.5. One of the major differences between the previous versions of Mac OS and OS X was the addition of the Aqua GUI, a graphical user interface with water-like elements. Every window element, text, graphic, or widget is drawn on-screen using spatial anti-aliasing technology. ColorSync, a technology introduced many years before, was improved and built into the core drawing engine, to provide color matching for printing and multimedia professionals. Also, drop shadows were added around windows and isolated text elements to provide a sense of depth. New interface elements were integrated, including sheets (document modal dialog boxes attached to specific windows) and drawers. On all versions from (and including) Lion, Rosetta is no longer available. On June 8, 2009, Apple announced at its Worldwide Developers Conference that Snow Leopard (version 10.6) would drop support for PowerPC processors and be Intel-only. However, Rosetta is still available in Snow Leopard; it is not installed by default, but it is available on the installation DVD as an installable add-on and is installed automatically via the Internet when first attempting to run a PowerPC-based application. Support for the PowerPC platform was dropped after Mac OS X 10.5. Such cross-platform capability already existed in Mac OS X's lineage; OpenStep was ported to many architectures, including x86, and Darwin included support for both PowerPC and x86. Apple stated that Mac OS X would not run on Intel-based personal computers aside from its own, but a hacked version of the OS compatible with conventional x86 hardware was developed by the OSx86 community. PowerPC-only software is supported with Rosetta, though applications may have to be rewritten to run properly on the newer OS X for Intel. Apple initially encouraged developers to produce universal binaries with support for both PowerPC and x86. There is a performance penalty when PowerPC binaries run on Intel Macs through Rosetta. Moreover, some PowerPC software, such as kernel extensions and System Preferences plugins, are not supported on Intel Macs. Some PowerPC applications would not run on Intel OS X at all. Plugins for Safari need to be compiled for the same platform as Safari, so when Safari is running on Intel it requires plug-ins that have been compiled as Intel-only or universal binaries, so PowerPC-only plug-ins will not work. While Intel Macs are able to run PowerPC, x86, and universal binaries; PowerPC Macs support only universal and PowerPC builds. On June 6, 2005, Steve Jobs confirmed these rumors when he announced in his keynote address at the annual Apple Worldwide Developers Conference that Apple would be making the transition from PowerPC to Intel processors over the following two years, and that Mac OS X would support both platforms during the transition. Jobs also confirmed rumors that Apple had versions of Mac OS X running on Intel processors for most of its developmental life. The last time that Apple switched CPU families—from the Motorola 68K CPU to the IBM/Motorola PowerPC—Apple included a Motorola 68K emulator in the new OS that made almost all 68K software work automatically on the new hardware. Apple had supported the 68K emulator for 11 years, but stopped supporting it during the transition to Intel CPUs. Included in the new OS for the Intel-based Macs is Rosetta, a binary translation layer which enables software compiled for PowerPC Mac OS X to run on Intel Mac OS X machines. Apple dropped support for Classic mode on the new Intel Macs. Third party emulation software such as Mini vMac, Basilisk II and SheepShaver provides support for some early versions of Mac OS. A new version of Xcode and the underlying command-line compilers support building universal binaries that will run on either architecture. Tools such as XPostFacto and patches applied to the installation disc have been developed by third parties to enable installation of newer versions of Mac OS X on systems not officially supported by Apple. This includes a number of pre-G3 Power Macintosh systems that can be made to run up to and including Mac OS X 10.2 Jaguar, all G3-based Macs which can run up to and including Tiger, and sub-867 MHz G4 Macs can run Leopard by removing the restriction from the installation DVD or entering a command in the Mac's Open Firmware interface to tell the Leopard Installer that it has a clock rate of 867 MHz or greater. Except for features requiring specific hardware (e.g. graphics acceleration, DVD writing), the operating system offers the same functionality on all supported hardware. For the early releases of Mac OS X, the standard hardware platform supported was the full line of Macintosh computers (laptop, desktop, or server) based on PowerPC G3, G4, and G5 processors. Later versions discontinued support for some older hardware; for example, Panther does not support "beige" G3s, and Tiger does not support systems that pre-date Apple's introduction of integrated FireWire ports (the ports themselves are not a functional requirement). Mac OS X v10.5 "Leopard", introduced October 2007, has dropped support for all PowerPC G3 processors and for PowerPC G4 processors with clock rates below 867 MHz. Mac OS X v10.6 "Snow Leopard" supports Macs with Intel processors, not PowerPC. Mac OS X 10.7 "Lion" requires a Mac with an Intel Core 2 Duo or newer processor.